WelshnotBritish.com: How much will trident cost Wales? 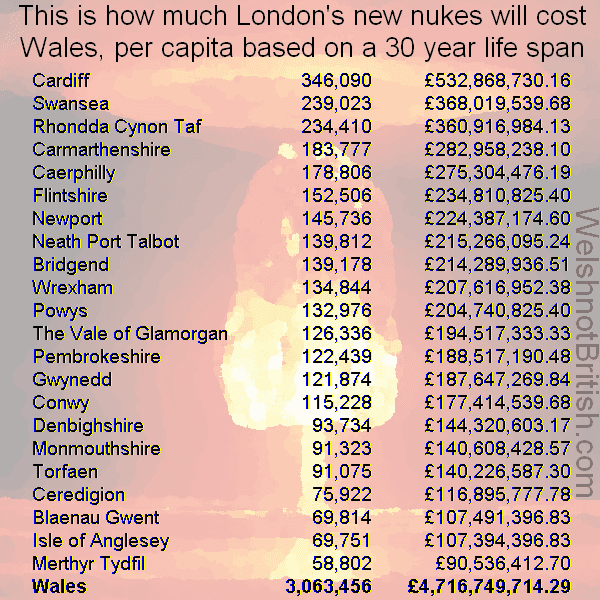 How much will trident cost Wales? Considering how we're always told that we are too poor to be independent I thought I'd look at some of the costs that we incur simply by not being independent. And as good a place to start with is trident, the big stick of the English or to use its proper terminology the nuclear missiles that England needs to own in order for other countries to think they are a big hard man. As a part of the UK Wales will have to incur a percentage of the costs of replacing trident and most importantly the upkeep of trident for its planned 30 year life cycle. The figures I'll be using are from a Green Peace report from 2009 so if anything they will be lower than the figures will be when the official decision to replace trident is taken in 2016. The costs are quite simple to break down. The general consensus is that the initial cost will be between £20 - £25 billion with an annual upkeep of around £2 - £2.4 billion. Those figures used are from 2011 and using the upper figure it equals the 2009 Green Peace figure. CND Cymru put it at £100 billion but we'll go with the Green Peace figures. 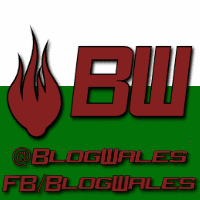 Using the 2011 census figures it's quite easy to divide the £97 billion by the total population of the UK and then multiply it by the populations of Wales and each of its counties in order to tell us how much Wales' share (pro-capita) will be and how much that works out for each local area. For the 3.06 million people in Wales our share of the bill for the nukes will come to around £4.7 billion. Now of course the UK is skint, it has no money at all and its trillion pound deficit is getting larger and larger as it has to borrow hundreds of millions of pounds every single day, billions each week just to keep the London casino ticking over. So this money is just going to be put on the tab, but that's ok because whatever goes on the tab is also going to be charged to us, just as the interest will be. One last thing to consider though is that Scotland are about to vote on whether they get to become a proper country that is nuke free and able to use its resources for the benefit of its people or to remain a colony. The £4.7 billion figure is achieved by first dividing by the UK population. If Scotland votes yes then the UK population drops and our share goes up. Of course in this situation the UK might take the sensible decision and abandon any plans to buy new nukes. If it doesn't then on top of the £5.1 billion it will now cost Wales there will also be the added costs of building new infrastructure.